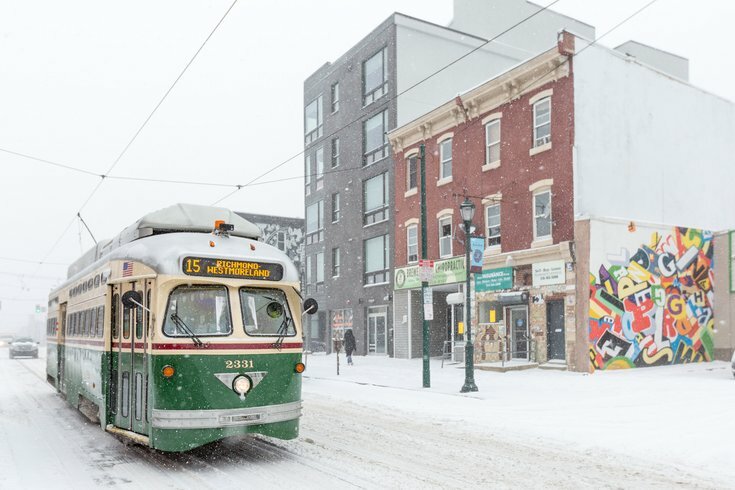 An eastbound 15 trolley rolls along near 26th Street and Girard Avenue in the Brewerytown section of Philadelphia during a January 4, 2018 snowstorm. The City of Philadelphia has declared a snow emergency beginning at 9 a.m. Wednesday. That means all parked cars must be moved off Snow Emergency routes for plowing. When moving your car, park as far from the corner of the street as possible; vehicles parked too close to the corner get in the way of snow plows trying to turn corners. Snow Emergency information and a map of Snow Emergency routes can be found on the Streets Department website. Cars left on Snow Emergency routes will be moved to other parking spots to assist in snow plowing operations. If your car is moved, call 215-686-SNOW to find it. Do NOT call 911. The Office of Emergency Management will activate the city’s Emergency Operations Center at 5 a.m.
All schools and administrative offices in the School District of Philadelphia will be closed. All early childhood centers also will be closed. Archdiocesan high schools and parochial elementary schools in Philadelphia are closed. Schools in the suburbs typically follow the decision of their local public school district. All municipal city offices in Philadelphia will closed and all non-essential personnel are encouraged to stay home. Government offices and courthouses in Bucks, Chester, Delaware, Montgomery, Burlington and Camden counties will be closed. SEPTA has announced that Regional Rail service on Wednesday will operate on a Saturday schedule, in accordance with its Severe Storm Service Plan. The Wilmington/Newark Line will operate an enhanced Saturday schedule and there will be no Cynwyd Line service. Norristown High Speed Line trains will run every 20 minutes. Several city bus routes will be delayed, detoured or suspended starting at 9 a.m. Wednesday. Additional routes may be affected depending on how much snow falls and other effects of the storm. NJ Transit will operate at Severe Weather Schedule Level 1 service on its rail system for Wednesday. Access Link Service will cancel all service statewide on Wednesday. Customers will be contacted and updated via Access Link Online accordingly. Many Wednesday flights have been canceled. The airport advises passengers to check flight status with their airline before coming to the airport wherever you’re flying. Some airlines are offering fee waivers to change itineraries for booked travel to/from certain cities on certain dates in anticipation of the storm. If you're planning to fly over the next couple of days, check with your airline for details. To get flight status, call your airline, get updates at 1-800-PHL-GATE or check the airport website, www.phl.org. There is a 45 mph speed restriction on the entire Pennsylvania Turnpike and Northeast Extension and a ban on empty straight CDL-weighted trucks, Large Combination Vehicles (double trailers), tractors hauling empty trailers, any trailers pulled by motorcycles, passenger vehicles, pickup trucks or SUVs, all motorcycles, all recreational vehicles, or RVs. The vehicle ban is also in effect on I-95, I-76 and I-476. Restrictions will remain in place through the storm. The Philadelphia Parking Authority will not enforce meter and time limit violations after 9 a.m. Wednesday due to the snow emergency. The PPA will enforce all snow emergency and safety violations. Vehicles illegally parked on snow emergency routes will be subject to ticketing and towing. PPA will offer discounted parking in Center City garages during the snow emergency to help lessen the amount of cars parked on the street. Beginning at 9 a.m. Wednesday and running through the end of the snow emergency period, a special 24-hour flat rate of $5 is available for the following parking facilities below. PECO said Tuesday it has mobilized field and support personnel, including tree crews, to be ready to respond to potential service interruptions caused by the storm. In addition, contractors from PECO’s Exelon sister utility ComEd in Illinois have been dispatched to assist in the mid-Atlantic if needed. PECO asks its customers, including those with smart meters, to report any outages at peco.com and via PECO's free mobile app. Customers may also report outages and downed wires by calling 800-841-4141. To sign up for email and text notifications, visit peco.com/alerts. Customers with special needs, including the elderly, disabled or those dependent on electricity for medical equipment, should have alternate arrangements in place should they experience an extended power outage. PECO's restoration priorities are public safety and critical care facilities, such as 911 centers, hospitals and pumping stations. Then restoration is generally scheduled so that the greatest number of customers can be restored as quickly and as safely as possible. But in cases of extended power outages, consideration is also given to customers who have been without service for the longest. Sanitation and recycling collections in Philadelphia will be suspended for Wednesday. Residents who normally have collections on Wednesday are asked to hold their trash and recycling until Thursday. Thursday and Friday collections will also be delayed one day, and residents should be prepared for further delays depending on the length and severity of the storm. Wednesday: Snow, heavy at times. Some thunder is also possible. High near 33. Breezy, with a northeast wind 16 to 21 mph. Chance of precipitation is 100 percent. New snow accumulation of 6 to 10 inches possible. Wednesday night: Snow, mainly before 4 a.m. Low around 30. North wind around 16 mph. Chance of precipitation is 100 percent. New snow accumulation of 3 to 7 inches possible. Thursday: Mostly sunny, with a high near 44. Northwest wind 15 to 17 mph.